The high-profile success stories aside, many companies struggle to run their omnichannel operations at a profit. We asked the experts for some advice. Omnichannel distribution was one of the hottest trends in the retail sector this year, with companies across the industry rushing to combine their e-commerce fulfillment operations with those for brick-and-mortar store sales. Retailers have adopted a wide variety of approaches when it comes to omnichannel fulfillment. Some fill orders placed by online customers by pulling items directly from retail shelves, others run separate fulfillment operations for e-commerce and store replenishment orders, while still others combine these operations, using a single DC to fulfill e-commerce orders, replenish retail stores, and ship wholesale orders. Despite success stories at companies like clothing retailer Abercrombie & Fitch and department store chain Dillard's Inc., not all omnichannel operations are revenue rockets. In fact, many companies struggle to run their omnichannel operations at a profit. "Omnichannel is absolutely being done, although it's taking up lots of resources and probably not being done as profitably as many of us would like," said Jason Denmon, apparel and specialty retail industry leader at the distribution consulting and design engineering firm Fortna Inc. So what can retailers do to change that? We asked some experts for their advice. The first step in fine-tuning an omnichannel operation so that it runs more profitably is to identify which fulfillment flow the company wants to optimize, Denmon said. No single company can do it all, so it helps to target investment in one place, such as tracking truck routes within its own fleet, choosing a reliable third-party logistics (3PL) partner, or shipping parcels with an overnight carrier. "Some firms do 'buy online, pick up from store'; some do 'buy online, ship from store.' You need to monitor whichever fulfillment flow you're using, and go back and optimize that," said Denmon. For example, some retailers offer free shipping for home goods and bulky items ordered online if the customer is willing to pick them up from the store. Such a retailer might save money on omnichannel operations if it adjusted its truck routes to make sure each shipment leaving the warehouse was a full truckload. A second crucial step for boosting the profitability of your omnichannel operation is to set realistic shipping fees. That can be difficult in a market where online retailers compete for customers by offering free shipping or next-day delivery. But companies that sell $10 items can seldom make a profit shipping one or two units to an online buyer's home. Shipping costs will simply wipe out their profit margins. That's led some retailers to adopt a more nuanced, choice-based approach. "The more progressive retailers have changed their website designs to communicate options to customers and give them choices," Denmon said. "For example, you can have it shipped for free and wait three to five days, or you can upgrade and get it tomorrow. They let the customer choose what speed is worth." A variation on that scenario has been playing out in the U.K., where some online grocers have begun charging a fee for their "click and collect" programs, where online shoppers place food orders at home, then pick them up in person at the nearest supermarket. However, that model has met with some resistance. The grocers are simply charging for their picking and packing services, but many customers have been outraged because they've become accustomed to free shipping, said David Jefferys, global market leader for e-commerce and omnichannel at KUKA Swisslog. "Same-day service is a race to the bottom," Jefferys said. "The service level has to increase with a cost. There's no win-win that leads to an increase in service level without an increase in cost." Many retailers have been paying for shipping all along, whether they charge their e-commerce customers or not. But that means they have to find some way to offset that hidden cost. A number of brick-and-mortar retailers have used funds from other departments to subsidize the cost of building out their omnichannel fulfillment operations, Jefferys said. That accounting may work fine for the launch, but as e-commerce begins to account for a larger share of total revenue, the operation becomes more expensive and tougher to justify. Faced with that reality, many companies have chosen to outsource their e-commerce fulfillment to a major third-party logistics service provider (3PL) such as DHL International, said Jefferys. Huge retailers like Amazon.com Inc. and Alibaba.com can afford to run their own distribution channels, but most of the smaller players need help with transportation and warehousing. But even the major retailers are likely to face challenges when it comes to building a homegrown omnichannel operation. For example, there's the question of where to locate their operations. A company that builds a DC dedicated to e-commerce must decide whether it needs to provide one- or two-day delivery to customers' homes. That decision may affect whether it picks a warehouse located near Louisville, Ky., or Memphis, Tenn., depending on whether they're a UPS Inc. or a FedEx Corp. shop, said Marc Wulfraat, president of the Montreal-based consulting firm MWPVL International Inc.
Another challenge in building a successful omnichannel operation is balancing the demands of e-commerce with those of retail store operations. The primary function of physical storefronts is to serve as a showroom for the company's products and to allow sales associates to build relationships with customers. But a situation where workers are pulling inventory off store shelves even as live shoppers try to fill their carts is hardly conducive to relationship building. "Let's say a guy grabs the last box of your favorite cereal and he's wearing a Wal-Mart uniform," said Wulfraat. Chances are, the in-store shopper will be left feeling that the company values the e-commerce customer's business more than his or her own. In addition to potentially offending shoppers, some retailers find that fulfilling e-commerce orders from stores is simply inefficient, Wulfraat said. Store employees may find that it takes much longer to pick and pack specific items in a hectic retail environment than in a well-ordered warehouse. Despite the challenges, big national retailers such as Macy's Inc., Target Brands Inc., and Wal-Mart continue to fill orders from stores, he said, setting the standard for running an omnichannel operation and keeping the pressure on their competitors. As for what the future holds, it's anybody's guess. 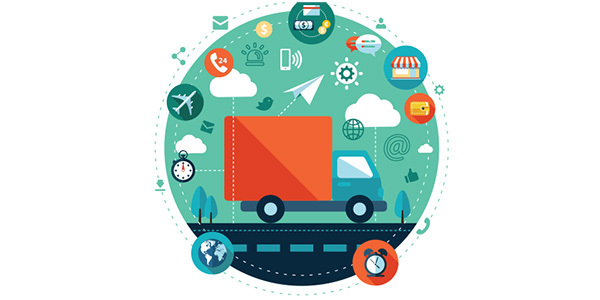 As a recent survey made clear (see "Study: Omnichannel retailers still fine-tuning fulfillment operations" in this issue), there are just two universal truths when it comes to omnichannel distribution: each company is adapting to the omnichannel challenge in its own way, and the future will continue to bring changes in fulfillment strategies and practices. As they grapple with the logistics challenges that omnichannel brings, retailers continue to tweak their operations—whether that means adopting tried-and-true technologies or experimenting with drones.